and the Huangshan Mountain was an essential motif to painters at the turn of dynasty from Ming to Ching in China. It is well known that Cezanne in his later years used to paint Mont Sante-Victoire day after day. Both in the East and the West, many painters since old times have painted mountains,from the small ones neighboring on villages to the big like the Japan Alps and tbe Himalayas. Rising to the sky,mountains are sublime and beautiful. But they sometimes refuse and lead us astray. As religious,sporting,adventurous and purely aesthetic objects, mountains have been adored and held us in awe. Needless to say,they have attracted many painters. Kouzui Shimoura is one of them,and has been fascinated with mountains. 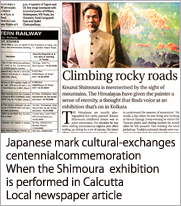 ln 1956,it was on the news that the Japan Mountaineering Party had sueceeded in reaching the summit of Mt. Manaslu in the Himalayas. Mt. Manaslu is 8,156 meters in height and the eighth highest mountain in the world. The news deeply moved many people, and also touched Shimoura's heart. At that time he was a junior high school boy in Osaka, and the following year he recklessly challenged to climb Hodaka mountains. Although be climbed with his elder brother,it was nothing but adventure. Shimoura looks back over it and says, " I climbed with jeans and canvas shoes on, without crampons. As l didn't know about mountains,l didn't care about my outfit. It was thoughtless climbing.When l think of it now, that climbing must have heen as dangerous as losing my life. All l had was an enthusiasm for climbing, which moved me into such an action without thinking about the fear of nature. Therefore,I had just a broad impression that the mountain was big and beautiful,and couldn't feel the atmosphere deeply as l lost my composure in this adventure." 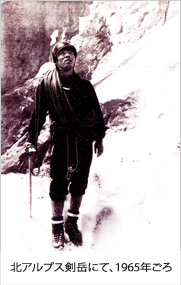 he had lived and worked in mountains, mainly Mt.Hodaka mountains and Mt.Tsurugi. and has made up my humble stance to mountains. The more experience I have got in climbing them, the more discoveries I have. Paintings express not only realistic but also fictitious world. Therefore it could be reasonable to deform a visible world, but it becomes unworthy if the deformation is the lack of the subject's essence. It is very difficult to understand essence of　mountains. Is it true that only mountaineers could understand the essence of mountains? Shimoura says, "Only the people who have climbed mountains could grasp the essence." He also says that it is difficult to express their beauties which he wants to paint on the canvas, though he has a lot of experiences in mountains. He recalls a day and says, "When I was living and orking in Mt.Tsurugi,I used to go to see the Toyama plains every evening. The moment the sun sets,we have a high possibility to encounter graceful scenes of mountains. It was happened on a windy day,just before the typhoon came. Glolden coloured clouds were running on the dark sky,red ones were leaving tracings above the horizon,and the brown rocky mountain was enhanced by light. In the middle purple broken clouds appeared and green ones were floating up straight above the sea of clouds.This beautiful scenery was beyond all description." Nature has profound beauties,and in some cases it creates incredible colours. Meanwhile,painting has profound expressions. Painting has to express such an incredible nature with paints. The colour seen in the mountain might be beyond our daily images. Simoura does not simply paint such a scene with ordnary colours. His strong colour scheme he builds up is the fruit of earnest communication with mountains for many years. When painters paint mountains, they usually feel interest in shapes of mountains. Then they become keen to express their mystique. About this point, Shimoura says,"When I was twenty years old, I took charge of a small hut in Yatsugatake mountains and l was staying at just a six-mat room. At night, however,l was seized with fear and got to no sleep until the dawn. The third day,I felt to be impatient to go back to town. I recognized my weakness derived from the urban life. But strangely enough, this miserable feeling challenged me to go out on the fourth night, Just then I calmed down. At break of dawn, the South Japan Alps, Mt. Kaikoma, and Mt.Fuji came into my sight, and then the sun raised. Unconsciously I said to thank the scenery.Since then I have had conceived an adoration for mountains, which is nothing to do with religious faith. It doesn"t mean spiritualism, but it is impossible to express mountains without the adoration for them." "The Himalayas is so big that we can not find any words to describe it, expect a word, the universe, it is entirely different from a world of 3,000 meters in height and beyond our images. More than 5,000 meters above cobalt blue sky spreads as if the sky made my hands dye in blue. It is as blue as the stratosphere becomes visible. As an admonition to myself, I do not dare to step into a world more than 5,000 meters. If I were young, I might have enough energy to climb upper. Meanwhile I have another feeling that I want to keep it unknown for me to be more imaginative," he says. his work called 'Longing for Muztagh Tower' has a marvelous scene as if mountains were floating in the air, In this work, he expresses his longing for the mountain which he has never been to, His longing and passion for mountains never fade away. 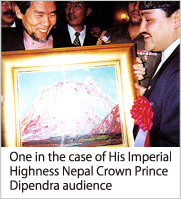 Although he has painted various mountains, now the Himalayas is the main theme of his works. 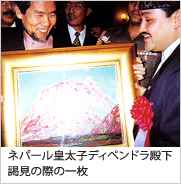 His interest in mountains originated in a report and a documentary movie of climbing up to the summit of Mt. Manaslu. When the commemorative exhibition for the opening of the Kansai International Airport Was held in 1994, Shimoura"s works were exhibited along beside model planes reconstructed by a scholar in planes of the Edo period. 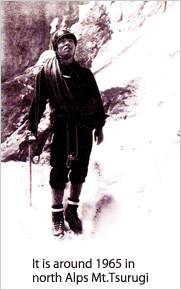 It is the leader of the ountaineering party of Mt, Manaslu who cut the tape for the opening. COPYRIGHT(C) KOUZUI SHIMOURA ALL RIGHTS RESERVED.